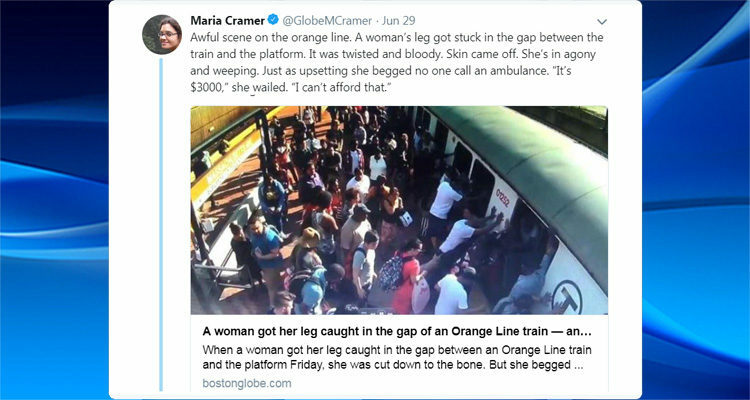 Boston Globe reporter Maria Cramer posted a heart-wrenching Twitter thread about a woman who had her leg caught between a train and the platform last Friday. She was, ultimately, transported via ambulance to a nearby hospital. A police report indicates the 45-year-old woman did not break any bones but lacerated her leg badly enough that she will likely need surgery. [Cramer’s] account of the story has since been retweeted more than 7,000 times, and it demonstrates how cruel—some might say uncivil—it is to have a system in which someone can go broke if they get hurt, or that at the very least the crushingly expensive cost of care is something you have to keep on your mind, even if your leg is smashed by a train. “This Tweet Captures the State of Health Care in America,” wrote the New York Times editorial board, reflecting on the heartbreaking story. The video shows at least ten passengers pushing on the car to get her out. To see so many people rush to help a person they didn’t know was incredibly moving. Afterwards, one woman who helped the injured woman wiped her hands with a napkin. She had woman’s blood on her. She also addressed remarks regarding the possibility of using Uber for transport instead of an ambulance to save money. From what I saw on that platform on Friday, the idea of random people picking up this injured woman, carrying her through the crowd then up the elevator and through the station to a waiting car would have been a bad one. A nurse standing by said she needed an ambulance. The injured woman said the ambulance would cost her $3000. EMS tells me the price would have been more like $1200 for someone with her injuries. That’s still a hefty price tag. Cramer went on to explain Massachusetts healthcare option citing a conversation with Brian Rosman, policy director of Health Care for All. Our thoughts and prayers go out to the unidentified woman in the incident and Cramer reports that there have been local efforts to assist the woman in paying her medical bills.